Born Christopher Megail Moore in Kingston, Jamaica to a bloodline of singers where he was surrounded by many talented musicians, this euphonic wunderkind discovered his ear for music at the age of 8. By the age of 10 while living in the United States of America he skillfully began composing his own music, writing his first song that same year. His music is strongly influenced by his Jamaican background as well as British Pop, American Pop/R&B and Alternative Rock. His musical influences include the great Bob Marley, Sam Cooke, Michael Jackson, Elvis Presley and Phil Collins. Music comes naturally to Christopher and as he matures so does his sound. His main objective is putting out songs that keep ones attention on everyday realities and help to inject a true sense of morality into today’s society. With this mindset and his unwavering belief in self, Christopher IQ Moore is well on his way to being recognized as a top revolutionizing force amongst performing artists. 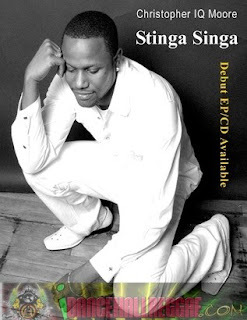 Currently, the artist also known as Stinga Singa IQ is completing his debut double album "Split Personality: The saga continues" Got To Know God/A Moor's Love: due stores Summer 2010, while steadily building his management and production team. IQ's purpose to educate and promote meditation and reflection has become evident to those fortunate enough to have known him beforehand on what promises to be a historic journey ahead.